This package comes with all the necessary accessories to conveniently strip any commercial tile floor. 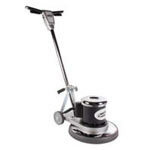 The 20 inch floor scrubbing buffer can be used in combination with the 20" pad driver, the black floor stripping pads, and the concentrated stripping solution to strip off your old floor finish, and prepare it for a new coat of high shine wax. Each quart of Shattered 99 concentrated floor stripper will yield 5 gallons of ready-to-use stripping solution. Just mix 1 quart of stripping solution with 5 gallons of hot water! Then add the solution to your 4 gallon solution tank to dispense as needed. After stripping and re-waxing of your floors is complete, use the 20" white pads to polish the floor finish to a high shine. For a glossier shine to your finish, you may want to consider also purchasing one of our high speed electric floor burnisher buffers. These machines spin at high speeds and really bring a nice shine to your floors. Make sure to also check out our package deals for floor buffing and cleaning for even more price saving advantages!